When it comes to athletes at CSUSB, the off-season is a time where teams come together to work on strength and agility. It allows their muscles to be in the best possible condition for when the season comes around. Most college sports seasons are intense because of the large amount of games played over such a short period of time. Athletes have to do their workouts around their scheduled classes. Before the quarter starts, coaches send out times where they are not allowed to schedule any of their classes. Athletes work in a separate gym at the school, where it gives them the opportunity to work out with two highly knowledgeable coaches. “The gym for only athletes is great because we get to work out with coaches who know exactly what will improve our game,” stated Trevan Estrellado of men’s soccer. Different teams have different rules from the National collegiate Athletic Association (NCAA). For example, the men’s and women’s soccer teams are only allowed to kick a ball for two hours per week. So while they can only do two hours per week, which tends to be split up on two separate days, the teams work the other three days in the tent on their strength and conditioning. The pinnacle of the strength and conditioning tent time is just before the season is about to get started and you’re working out to make sure you’re physically up to the task when the season comes along. 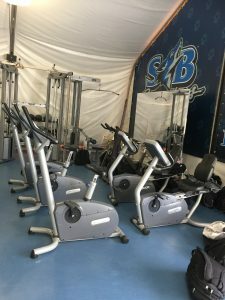 A normal workout for the athletes tends to consist of working in the tent on some sort of mobility, alongside weightlifting to improve their muscle density. “The tent improves my game in a prominent way,” said Cassandra Bermudez of women’s soccer. “They really help us to focus on strength and speed, the little things that enhance our performance a long way,” added Bermudez. When the session is finished the athletes do different sorts of fitness workouts to make sure that will improve all parts of their fitness such as Aerobic and Anaerobic exercise. “In off-season, my diet does change as I try to eat more healthy,” said Estrellado. “I change all my grain foods to wheat,” added Estrellado. Diet is important for athletes in off season. It’s a time where they try to work on increasing muscle and getting fit for next season again. Off season is there for more than just athletes time to get healthy and fit though, as it’s a time where they mainly focus on school to get the best grades possibly to stay academically eligible. “The best thing about off season is the amount of downtime we get from playing sports as we are able to focus more on our classes to get the best grades we can,” said Bermudez. Athletes have a responsibility to keep their GPA above a 2.0 according to the NCAA. The school wants students to have a GPA above 3.0 and if athletes do not meet this standard, then the students are required to do 6 hours per week in study hall. Games are not the only thing student-athletes focus on. During the off-season, their priorities get added on to even more.